The Real Cost of Castro Inc.
Will new Cuban policy translate into big business? Fox News Contributor Gillian Turner says it will take years to figure out who will financially benefit from new policy between Cuba and the U.S. There is a price that the Cuban regime will exact from American companies to do business there if U.S.-Cuba relations are fully normalized, a price that likely won’t benefit the country’s lower classes, but will instead line the pockets of Castro & Co., experts on Cuba warn. Because of its tight grip, the Castro regime has kept Cuba’s GDP hamstrung. It’s economy is now at a tiny $72.3 billion, less than half that of the state of Iowa, notes Richard J. Peterson, senior director at S&P Capital IQ. In fact, the average worker earns less than $25 a month. Cuba is in crisis, it needs a bailout. Its crony communism has failed, it is steeped in debt, and its money is running low. Historically, Cuba has enjoyed lifelines in the form of money and oil from Venezuela, which had been generously supplying 100,000 free barrels of oil a day, estimates show, nearly two-thirds of Cuba’s consumption needs. But Venezuela is on the brink of financial collapse as oil continues to plunge toward $60 a barrel, according to sources there, and it cannot supply Cuba the oil it needs. Plus Venezuela is now enduring three health epidemics: Malaria, dengue fever and chikungunya. Russia has also subsidized Cuba’s economy, but it, too, faces a severe economic contraction as oil nosedives. Cuba needs tourism dollars, it needs trade and bank credits to save itself from bankruptcy. But it wants all that even while it keeps its failed government model in place. Cuba is run by a Soviet-style nomenklatura filled with party elites who call the shots behind the scenes, and who have gotten spectacularly wealthy in the process, all while abusing its people and business partners. Critics of the government, perceived enemies of the state, even those calling for basic human rights continue to be arbitrarily imprisoned without charge or due process, many beaten, even killed. The Cuban power elite are the Castro brothers and their families, their party chieftains and army leaders. The Cuban economy has changed little since the collapse of the Soviet Union. Unchecked by a probing, independent media or Congress, the Cuban power elite enjoy rich salaries, vacations overseas, yachts, Internet access, beach compounds and satellite dishes to see U.S. movies, notes Cuban émigré and lawyer Nestor Carbonell, author of “And the Russians Stayed: The Sovietization of Cuba” (William Morrow & Co., 1989). The communists in Cuba routinely expropriate the assets of foreign investors, and have seized and control everything of value, including hotels, car distributors, banks, the sugar industry, resorts. Carbonell adds that, just as Friedrich Engel, co-author of the Communist Manifesto, once said, also holds true of Cuba today, that “once in the saddle,” a new ruling class “has never failed to consolidate its rule at the expense of the working class and to transform social leadership into exploitation.” If relations are fully normalized, American tourist dollars would pour into companies owned by the Castro regime, since tourism is controlled by both the military and General Raul Castro, warns the Cuba Transition Project (CTP). That means rum, tobacco, hotels and resorts are all owned and operated by the regime and its security forces. Cuba’s dominant company is the Grupo Gaesa, founded by Raul Castro in the nineties and controlled and operated by the Cuban military, which oversees all investments. Cuba’s Gaviota, run by the Cuban military, operates Cuba’s tourism trade, its hotels, resorts, car rentals, nightclubs, retail stores and restaurants. Gaesa is run by Raul’s son-in-law, Colonel Luis Alberto Rodriguez Lopez-Callejas. The number of foreign companies doing business in Cuba have been cut by more than half since the 1990s, to 190 from some 400. Reasons include: Being forced to partner with army-controlled groups; hire workers through state agencies; and the freezing of bank deposits. Complaints have poured in from former senior executives at Dow Chemical, General Mills, Bristol-Myers Squibb, Colgate-Palmolive, Bacardi, American Express Bank, PepsiCo, Warner Communications, Martin Marietta Aluminum and Amex Nickel Corporation. Iberia, Spain’s national airline which at one time accounted for 10% of foreign commerce with Cuba, killed its Havana routes because they were unprofitable. If U.S.-Cuba relations are normalized, fresh, new American dollars will only enrich the elite, “dollars will trickle down to the Cuban poor in only small quantities, while state and foreign enterprises will benefit most,” warns CTP, adding U.S. travelers to Cuba could still be “subject to harassment and imprisonment.” Over the decades, tourists visiting Cuba from Canada, Europe and Latin America and spending money there have only strengthened Cuba’s totalitarian state, it notes. 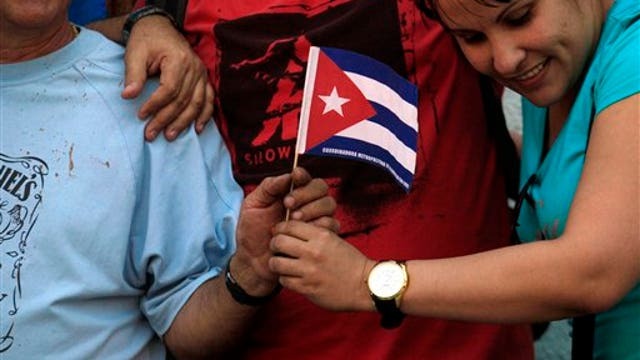 There is a chance the free-flow of information from free trade could spark change long-term, but that could trigger an immediate, violent crackdown from the Cuban government, much like what occurred during the Arab spring. Another significant factor: Corruption is rampant in Cuba, it has no independent, transparent, legal system, Cuba appoints its judges and licenses lawyers, and it repeatedly arrests peaceful pro-democracy activists. Plus it is a debtor nation with a long history of defaulting on its loans. U.S. businesses risk having their operations confiscated by the government, and/or never seeing their loans repaid. Cuba exports nickel, but that is largely controlled by Canadian interests, and its sugar industry is on the ropes. About 600 European suppliers have had over $1 billion arbitrarily frozen by the government since 2009, “and several investments have been confiscated,” CTP says. In fact, Cuban law lets the government confiscate foreign assets for “public utility” or “social interest,” CTP says. Three CEOs of companies doing hundreds of millions of dollars’ worth of business in Cuba were arrested and stuck in jail without charges or due process: Cy Tokmakjian of the Tokmakjian Group, Sarkis Yacoubian of Tri-Star Caribbean, from Canada, and Amado Fakhre of Coral Capital of Great Britain. All of this is why Cuba is ranked 176th out of 177 countries on the index of economic freedom put out by the Heritage Foundation, beating North Korea at dead last, but ranking worse than Iran and Zimbabwe.